The change took place early Thursday morning on the U.S. Apple Store. Similar cuts are rolling out to international markets as well, but not all markets are as low as the $299 retail on the U.S. store. Apple corporate employees reached on Monday morning not authorized to speak on behalf of the company said to AppleInsider that the price cuts are permanent, and a result of manufacturing savings at scale. Apple's HomePod has an array of seven tweeters, each with their own individual drivers, custom amplifiers and transducers. Each tweeter comes custom-designed with a precision acoustic horn that directionally focuses sound. The HomePod also has advanced sensors that analyze the space, so the speaker knows where it is positioned in a room. The device then uses audio beam-forming to focus the sound towards the center of the room while minimizing sound projected towards any walls. Vocals and direct sound can be beamed them to the middle of the room, or bounced off the walls to create an ambient audio feel. It can even create stereo sound by splitting audio channels between the multiple tweeters. Another HomePod in the same room will automatically pair with the first to create true stereo sound, while tuning audio to project towards the center of the room instead of towards each other. The HomePod also has a dedicated high-excursion subwoofer, which means the woofer diaphragm has high travel of 20mm, which Apple says is remarkable for a woofer that size. Higher travel means more air is being moved, creating more bass. The HomePod is controlled by Apple's Apple's A8 processor, the same chip found in the iPhone 6 and 6 Plus. The A8 is also in charge of Siri, which works with "Hey Siri" and can be used to do anything from checking the weather, converting units of measurements, playing a podcast, checking nearby traffic, setting a timer or reminder, and even sending a text message. 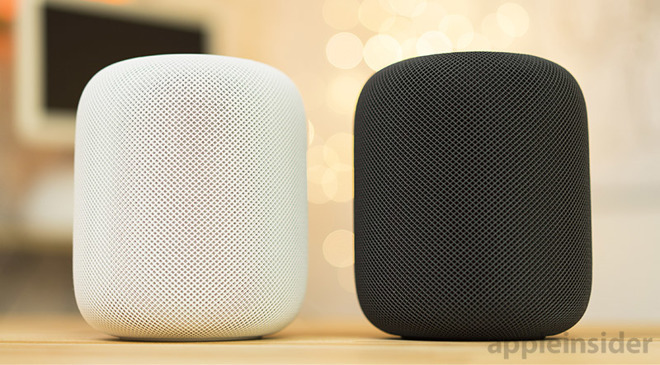 In February, it was rumored that the HomePod and the Apple TV 4K were being sold at cost or even at a loss, but that seems unlikely. Be sure to check out AppleInsider's HomePod Price Guide for the best deals at Apple authorized resellers.